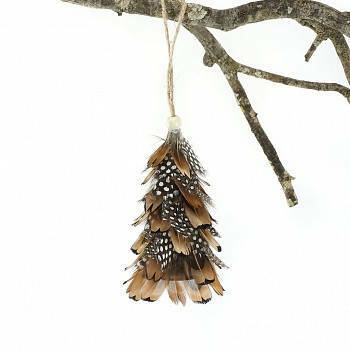 These adorable Mini Feather Tree Ornament are made with Natural Pheasant and Guinea Feathers or Dyed White Feathers w/Glitter tips details; measuring approximately 4-4.25" tall and 1.75" diameter at the base. A natural jute hanging cord is located at the top of the ornament and finished with a natural colored bead at the top of the tree. 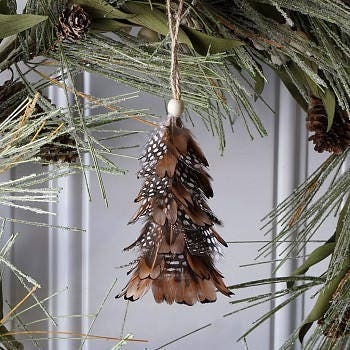 "SUGGESTED USES: Feather Ornaments are great decorations for Display, Floral, Holiday Trimmings for Thanksgiving and Christmas, Gift Embellishments, Home, Office and Special Event Decor. " SIZE: 4-4.25" Tall Our products are made with natural materials; therefore each item will have unique differences and variances.